The kinds of readouts will be independent of the kind of mutant you've decided to isolate, and the data should be informative, though preliminary. 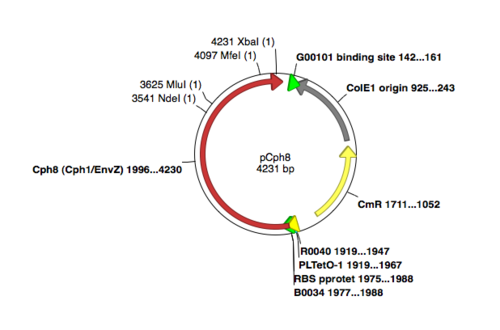 A map of the plasmid that encodes the light-sensor protein, Cph8, is shown. To make the libraries that we used last time, the plasmid was modified in two ways. First, an epitope tag was added to the 3' end of the gene so that the Cph8 protein can be detected with an antibody. The tag comes from a highly immunogenic protein called haemagglutinin, abbreviated "HA." In fact just 9 amino acids from this protein, YPYDVPDYA, in sufficient for antibody recognition--an experiment we'll work on today. 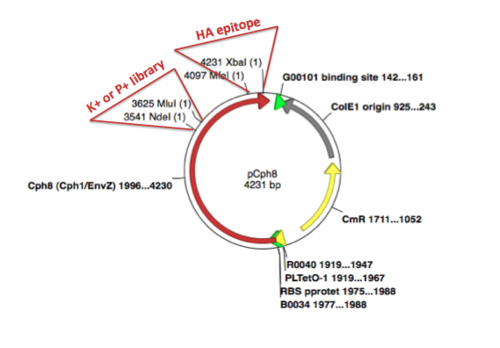 Second, the Cph8+HA gene was further modified with a randomized pool of oligonucleotides cloned between the NdeI and MluI restrictions sites in Cph8. The pools were synthesized with a mixture of nucleotides at the K+ or P+ relevant position as shown in the reagents list from today's lab. The degenerate oligo was amplified with PCR, digested and cloned into the pCph8+HA backbone...all techniques that you're already familiar with from the first experimental module. 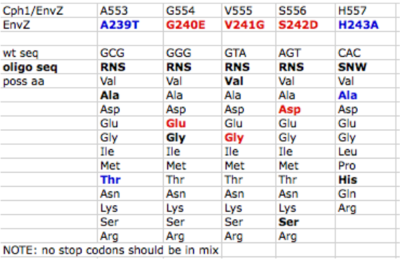 A key difference, however, is that the ligation products are a mixture of different sequences since the initial oligo template that was PCR amplified had a variety of sequences. The resulting pool of plasmids, as shown on the modified plasmid map, is what you transformed and screened last time. The mutant phenotypes you're following might be explained by changes in kinasing or phosphatasing activity of Cph8. They could also be explained by changes in protein expression. For example, if the protein's not made, then it cannot kinase OmpR, resulting in a P+ phenotype. Thus it's important to show that the protein still exists in the cell (at a minimum) and that its expression is about the same as the wild type protein (ideally). With a Western analysis, you will compare the expression levels of the wild type and mutant proteins, detecting the various Cph8 versions by detecting the HA-epitope tag that's been fused to the C-terminus of the gene. There are some important differences in protein and DNA gel electrophoresis. One thing you’ll notice right away is that the gel itself is different. DNA molecules are typically separated thorough an agarose matrix whereas acrylamide is used for proteins. Both are porous sieves that retard molecules based on their length, with smaller molecules moving through the matrix faster than longer molecules. Agarose gels are run horizontally and acrylamide gels are set in the tank vertically but gravity has nothing to do with either separation. Electrical poles draw the charged molecules through the matrix. Unlike DNA, proteins do not have a uniform charge so before electrophoresis they are coated with a charged molecule (called SDS) to add negative charge proportional to their length. You could expect proteins of identical length but folded into different shapes to separate differently (not the desired outcome) so proteins are also unfolded before they are loaded on a protein gel. This is done by boiling them in the presence of a reducing agent, breaking disulfide bridges and denaturing the protein. The last notable difference in DNA and protein electrophoresis is the visualization techniques used to find the molecules once they’ve passed through the gel. Recall that DNA was visualized with Ethidium Bromide, an intercalating dye that changes its fluorescence when bound to DNA. Proteins can be detected with Coomassie stain, which detects abundant proteins in the gel, turning them blue. Other more sensitive techniques are available for staining protein gels (for example silver stain). Finally, a Western blot can be used, as you will today, to transfer the proteins from the gel to a membrane that is later probed with an antibody specific to the protein of interest. In our case we will use the 12CA5 antibody to detect the HA-epitope on Cph8. Though you don't know for certain which, if either, of your mutants exhibits detectably different activity in the context of the bacterial photography system, you will send plasmid DNA from both mutants for sequencing. The invention of automated sequencing machines has made sequence determination a fast and inexpensive endeavor. The method for sequencing DNA is not new but automation of the process is recent, developed in conjunction with the massive genome sequencing efforts of the 1990s. At the heart of sequencing reactions is chemistry worked out by Fred Sanger in the 1970’s which uses dideoxynucleotides. These chain-terminating bases can be added to a growing chain of DNA but cannot be further extended. Performing four reactions, each with a different chain-terminating base, generates fragments of different lengths ending at G, A, T, or C. The fragments, once separated by size, reflect the DNA’s sequence. In the “old days” (all of 15 years ago!) radioactive material was incorporated into the elongating DNA fragments so they could be visualized on X-ray film (image on left). More recently fluorescent dyes, one color linked to each dideoxy-base, have been used instead. The four colored fragments can be passed through capillaries to a computer that can read the output and trace the color intensities detected (image on right). Your sample will be sequenced in this way on an ABI 3730 DNA Analyzer. Today is a busy day! In addition to running your protein gel and blotting the proteins to a nitrocellulose membrane, you will also isolate plasmid DNA from the cells to send for sequencing. Finally you'll set up new cultures of your mutants in the light and the dark so that you can measure the β-gal activity associated with the samples next time. Each group will run a lane of molecular weight markers, a lane with a positive control for the Western (e.g. an HA+ control lysate), a lane with the HA-tagged, wild type light sensor, and two lanes with HA-tagged mutants from your library screen. Two teams will share one gel. Retrieve the bacterial cultures carrying the wild type or mutant light sensors that have been grown for you. To compare intensities between lanes on the protein gel it's necessary that equal numbers of cells be loaded into each well. You'll assess the number of cells in each sample by making a 1:10 dilution of the three strains in Z-Buffer and use the spectrophotometer to measure the density of the samples at a wavelength of 600 nm. This measurement tells you something about the number of cells in a millileter of liquid. For example a reading of 0.7 says the sample has 0.7 OD units of cells / ml. Calculate the volume of your cells needed to give 4 OD. Thinking again about a sample that reads 0.7 OD: if you wanted to collect the number of cells equivalent to 4 OD unit, then you would have to collect 4/0.7 = 5.7 ml of that sample to get 4 OD's worth of cells. Heads up: don't forget that your spectrophotometric reading is for a 1:10 dilution of the original (undiluted) samples, so if you go back to the overnight cultures you'll have to take that dilution factor into account. Move the calculated volume of cells to well-labeled eppendorf tubes, and spin the tubes in a microfuge for 1 minute to pellet the bacteria. Remove the supernatant and resuspend each pellet in 100 ul of "EasyLyse" protein extraction solution (a commercial product from a company called Epicentre). Incubate the solutions at room temperature for 5 minutes, then pellet the debris by spinning the tubes in the microfuge (full speed) for 2 minutes. The supernatant is the lysate that you will run on your protein gel. Mix 30 ul of the bacterial lysates with 30 ul of 2X sample buffer. Sample Buffer contains glycerol to help your samples sink into the wells of the gel, SDS to coat amino acids with negative charge, BME to reduce disulfide bonds, and bromophenol blue to track the migration of the smallest proteins through the gel. Wear gloves when using sample buffer or your hands will get blue and smelly. Prepare your positive control HA-lysate tube by moving 50 ul of the sample to an eppendorf tube. Put lid locks on the eppendorf tubes and boil for 5 minutes. Put on gloves. Load the indicated volumes of each sample onto your acrylamide gel in the order below. Once you have loaded a sample from one tube, move it to a different row in your eppendorf tube rack. This will help you keep track of which samples you have loaded. 10. Once all the samples are loaded, turn on the power and run the gel at 200 V. The molecular weight standards are pre-stained and will separate as the gel runs. The gel should take approximately one hour to run. During that hour, you should work on part two of today's protocol. 11. Wearing gloves, disassemble the electrophoresis chamber. Place the gray side of the transfer cassette in a tupperware container which is half full of transfer buffer. The transfer cassette is color-coded so the gray side should end up facing the cathode (black electrode) and the clear side facing the anode (red). Place a ScotchBrite pad on the gray side of the cassette. Place 1 piece of filter paper on top of the ScotchBrite pad. Place your gel on top of the filter paper. Place a piece of nitrocellulose filter on top of the gel. The nitrocellulose filter is white and can be found between the blue protective paper sheets. Wear gloves when handling the nitrocellulose to avoid transferring proteins from your fingers to the filter. Gently but thoroughly press out any air bubbles caught between the gel and the nitrocellulose. Place another piece of filter paper on top of the nitrocellulose. Place a second ScotchBrite pad on top of the filter paper. Close the cassette then push the clasp down and slide it along the top to hold it shut. Place the transfer cassette into the blotting tank so that the clear side faces the red pole and the gray side faces the black pole. 13. Two blots can be run in each tank. When both are in place, insert the ice compartment into the tank. Fill the tank with buffer. Be sure the stir bar is able to circulate the buffer. Connect the power supply and transfer at 100 V for one hour. You can use this time to complete part 2 of today's protocol. 14. After an hour, turn off the current, disconnect the tank from the power supply and remove the holders. Retrieve the nitrocellulose filter and confirm that the pre-stained markers have transferred from the gel to the blot. Move the blot to blocking buffer (TBS-T +5% milk) and store it in the refrigerator until next time. While your protein gel is running and blotting, you can isolate plasmid DNA from the remainder of the overnight cultures of the 2 mutant candidates. The miniprep protocol we'll follow is already familiar to you from Module 1. Each sequencing reactions requires 200-500 ng of plasmid DNA, and 3.2 pmoles of sequencing primer in a final volume of 12 μl. Resuspended your plasmid DNA pellets in 40 ul of sterile H2O. The miniprep'd plasmid should have ~1 ug of nucleic acid/ul but that will be a mixture of RNA and DNA, so we will guess at the amount of plasmid DNA there and use 1 ul of your miniprep'd DNA/sequencing reaction. 6.4 ul of sequencing primer NO289 (this has already been diluted 1:100 from the stock). Pipet this sequencing solution up and down to mix and then transfer 12 ul to one of the tubes in the 8-tube strip we will turn in at the biopolymer's facility in E17 for sequencing. The data will be available for you to examine < one week from today. Keep your fingers crossed. To check the library candidates for the presence of the library fragment, the candidate DNA samples will be digested. Add 10 ul of each candidate DNA to eppendorf tubes, label them with your team color and a number, and give them to the teaching faculty. These aliquots of DNA will be digested with NdeI and MluI, enzymes that will release a 600 bp fragment if the mutant candidate is a reclosure of the Cph8 backbone and will release a <200 bp fragment (too small to see on a standard gel) if an oligo was cloned into the backbone. The digests will be run on a gel by the teaching faculty and the data posted to today's "talk" page when it is available. You will set up overnight cultures for your samples in the light and dark to assess the β-gal activity associated with your mutants. Review the protocol that was presented earlier in this module for details and ask the teaching faculty if you need help. To be turned in: You should prepare an outline for the introduction to the research article that you will write to describe your work in this experimental module. Your outline should include references that you have found to describe the system and your tuning of it. At this point the references can be in any format you choose. NOT to be turned in: You should update the Materials and Methods section that you are writing for your research article to include the experiments you have performed today. You must calculate the expected length of the Cph8 protein using the DNA sequence that's here. If you don't already have a favorite program for doing this calculation already, try to use the suite of DNA analysis programs that are here. This page was last edited on 10 November 2009, at 13:01.